For months I’ve managed to maintain a positive attitude despite daily doses of snow and ice and frigid temps, multiple school delays and closings, and even the flu. But since this crazy winter weather ruined my son’s plan to visit from college over the weekend, I’ve had it. You’re dead to me, Winter. I’m ready for warmer, sunnier days, and would love to be sitting on a turquoise-painted porch like this one in Florida right about now. Let’s take a look at this lovely old beach house on Amelia Island. and daydreaming about sunny days and palm trees. This house was the first one built in Fernandina Beach after the Civil War in 1866. There are 4 bedrooms and 2 baths. The house is featured at CIRCA Old Houses, which has more photos and information. Anyone else wishing they were lying on a porch like this with a fan whirring overhead today? I’m ready to pull out my sunglasses and flip-flops and get this summer started! 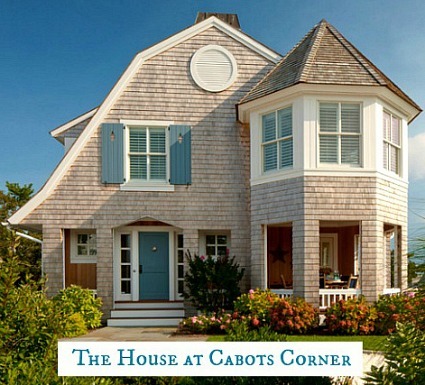 A WaterColor Cottage in Florida: Inspired by the “Something’s Gotta Give” Beach House? We’re getting another 8″ of snow today near Chicago. I’m so sick of winter that I just cancelled my dental appt. for tomorrow a.m., as I just don’t feel like going out in this! Meanwhile, today’s Florida house was divine, although I prefer something more casual + beachy. Have fun on your vacay! Another 8″? Holy cow. We were supposed to get freezing rain this morning but there’s no sign of it yet, so I’m hoping the weather forecasters got it wrong this time. Fingers crossed! I’m about a hot plate + 2 cats away from Grey Gardens. Ha! Hang in there, Kay! I never thought I’d come to this site and see my sweet Amelia Island on it! Thank you for the gorgeous look inside this beautiful home. I’ve passed it often and it’s nice to finally see the inside. Are you vacationing in Fernandina? No, we’ll be farther South on this trip, but I’d love to go there someday. I was reading about the island when I was writing this post and it looks beautiful!! * heavy sigh * With more snow forecasted on the way for us today plus a windchill of -23*C, makes it it seem as though winter is endless. If it wasn’t for Netflix releasing new “House of Cards” episodes, I think I’d be despondent. (BTW – Frank and Claire’s home would be HOH blog-worthy!). This beach house is bee-yoo-ti-ful! The soft colours, the sunshine streaming through the windows, that porch and the overall welcoming vibe make me long for a vacation to somewhere warm and sunny. My favourite feature is the fireplace with integrated mirror. I love those in older homes. Stay cozy, Julia. Summer will be here before we know it and we’ll all be complaining of the heat! I haven’t started watching the second season of “House of Cards” yet. Hope I have a chance to check it out this week! They do have a great house on that show. Try to stay warm, Jennah! SO over winter, it’s not even funny. Although this week is looking much more promising – the only thing that’s keeping me from losing my mind altogether! We might actually see some snow MELT. I would be happy just seeing grass right now, even if it’s not green. What a gorgeous home! Much bigger than I thought, by looking at the outside. Although, I’d take a hut in Florida at this point, if it meant warm weather. We’re headed down there next month for my birthday, and I can’t wait! Ooh, that sounds like the perfect kind of birthday gift to me, Jenny! Wish I was there for sure (it’s cold here in NYC as well). I’ll be planning my FL beach getaway soon… who knows, I might even end up on Amelia Island. Definitely a place that I want to visit. Stay warm!! Seeing these sunny, warm-looking photos is making me hate winter right now. I could very easily move right on into that great house, and spend my afternoons either on the porch, or walking about town with camera in hand. Painting porch ceilings blue is an old Southern tradition/superstition. That’s a great post about it — thanks, Tara! Yup, we are about to get another 3-6 inches here in NJ tonight. I normally do not mind winter, thanks to them being so mild these last few years, but this year has been awful and I have had it! We’re facing more snow tomorrow morning here on Long Island. This beautiful sunny cottage is just what I needed to take my mind momentarily off this relentless winter. Thanks so much! The blue color of the porch was used to give it a cool affect. Most victorian houses in Florida used blue especially on the ceiling. Also especially if it is in a historic district. So, pretty this one! Here in Holland we have not had one flake of snow and the temp today will be like 51! Im not saying this to rub in Winter, I’m origanlly from Michigan, I’m just so shocked we have had a mild winter here ! Stay warm everyone, I have family in Chicago area , Indiana and Michigan…. all the cold spots! As long as it doesn’t get hotter than 25 degrees C I’ll be there. Like you guys are sick of winter I’m ready for my favourite season…Autumn. Sorry you missed out on spending precious time with your son. This home is fabulously, the porch…..sigh. Hi Julia thank you for sharing beauty. Regards Esther from Sydney. PS in case I forget to say it….Have A Wonderful Vacation. I like snow and winter, but I’m over it too. Except that the thought of putting shorts on this body, never mind a bathing suit, has me in a panic. I need enough sunny, warmish weather right now to exercise and get ready for summer. This house is lovely, with a very charming front porch. My only complaint is those curtains that go higher than the windows. I know that’s supposed to make the ceiling look higher, and maybe it does, but it also looks weird. This is why I’ve lived in the south for the past 24 years. Y’all can have the winter. 😉 This last snow and ice blast we received completely immobilized Atlanta and the rest of Georgia. That was this past week, but this weekend it was in the 60s and this week is suppose to be more of the same. I lived in Boston for 4 years and that experience quelled any desire to experience long-term winters for good. I grew up in very hot climates, so I don’t think I’m destined to live in or thrive in cold environments even for a season. Love the house featured here, but not the decor. It’s a little too light and fluffy for my tastes. Lovely home. The rooms are so large and gracious. Everything looks so new and fresh. Funny, but I like older houses to look a little less trendy, though not stuck in another century, but showing its patina a little more. Yes, there are some older pieces scattered here, but mostly it feels new and up-to-date. Ha, I guess I’m a bit weird for preferring the romance of the old. We had our snow and ice last week, but today is supposed to be in the 60’s. Yay! That’s one thing about the south – you don’t stay cold for long. It’s such a fabulous, quaint, not-too-touristy town!! My family lives there, and I just escaped the snow last weekend for a quick visit. Can’t wait until we’re able to move down there permanently. Great post, as always! Gorgeous Amelia Island (ah, memories). Love the lemon yellow walls and sea foam green drapes downstairs – very tropical. We sure can use a fantasy oasis since we’re still digging out from the “white stuff” – more next week. Thank you for sharing. Have fun in FL, Julia! Hi Leta! I’m not sure but I think you must be referring to HGTV?